Free to Remarry | Redeemed! Frankly, I don’t like the term remarry. Remarry implies one is entering into marriage again with someone to whom they were previously married. When Sherri and I married, although we had each been previously married, we had not previously been married to each other. Therefore, we did not remarry…we married. 1 Corinthians 7:10-11 is sometimes quoted by those who hold a position that a believer who has experienced divorce is forbidden to ever remarry (or permitted to remarry only within very narrow legalistic rules contingent on either the death or prescribed level of sin by someone with whom they are no longer in relationship). Lifted out of context, it is easy to see why some take this as an edict from the Apostle Paul that any believer who has experienced divorce is forbidden to ever remarry. However, considered in context, it becomes clear that this is not the intended meaning at all. To correctly understand this passage, first the entire chapter must be read in context, and second the contextual use of terms must be noted, throughout the passage. Also, one must keep in mind that Paul was not married, and generally advised all unmarried people that it was better to remain unmarried, not as an edict, but as encouragement for those called to celibacy. But I say to the unmarried and to widows that it is good for them if they remain even as I. But if they do not have self-control, let them marry; for it is better to marry than to burn with passion. The term unmarried may be used to refer to anyone who is not currently married. However, Paul used distinctly different terms, in this passage, for a widowed person (chera) or a never-married person (parthenos). Therefore, it should be understood that in his use of the word unmarried (agamos), Paul is specifically including people who have divorced. This is made especially clear by Paul’s use of the word unmarried (agamos) in verse 11, where he is speaking specifically of a woman who has left her husband. So, then, verses 8-9 should be read as specifically including people who have previously divorced, and are now unmarried. For these people who have previously divorced, as well as for people who have been widowed, Paul advises a life of celibacy if that be their calling. However, he allows that marriage is not only permissible, but advisable, if they do not have a calling to celibacy. Given Paul’s advice in verses 8-9, we must conclude that his admonition in verses 10-11 is dealing with the circumstances and motive of divorce, rather than a life-long edict following divorce. Here, Paul is telling the church that a believer should never divorce for the specific purpose or intent of marrying someone else. This position is in keeping with the words of Christ in Matthew 19:3-12, where Jesus equates such behavior to adultery. I have discussed this passage in Matthew in a previous post as well as in my book on the topic of God’s heart toward believers who have experienced divorce. This is clearly neither a prohibition against divorce, nor a prohibition against remarriage at some time subsequent to divorce. Rather it is an encouragement to fully honor the marriage vows accompanied by a commandment against divorce for the specific purpose of marrying another. I think then that this is good in view of the present distress, that it is good for a man to remain as he is. Are you bound to a wife? Do not seek to be released. Are you released from a wife? Do not seek a wife. 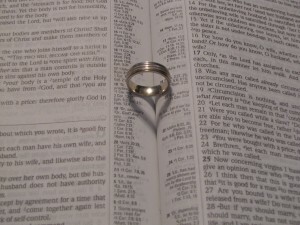 But if you marry, you have not sinned; and if a virgin marries, she has not sinned. The wording here is so clear as to leave little room for doubt of Paul’s intent. Due to present distress (whatever that might have been at the time) Paul advised each person to remain as they are, whether married or single. However, speaking specifically of a person who has experienced divorce (released from a wife), Paul said that if they do marry it is not sin. Paul’s clear intent is to allow the freedom to marry, for anyone who is unmarried, whether previously-divorced, widowed, or never-married. 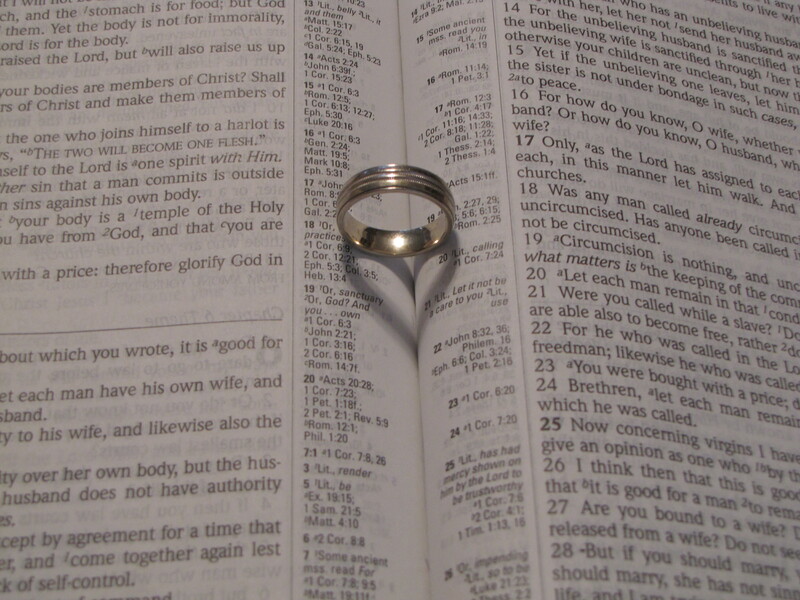 Paul treats all unmarried persons the same, regardless of circumstances. For all unmarried persons, Paul advises caution in regard to marriage, but clearly states that marriage is not sin, and that marriage is preferable to undue lust or temptation. Anyone who is married is under obligation to their marriage vows. Anyone who is not married is not under obligation and is free to marry. If you would like further reading on this topic, Divorce and Remarriage, A Redemptive Theology, by Rubel Shelly, is an excellent resource. This entry was posted in God's Position toward Us, Marriage-n-Divorce and tagged believer, bible, biblical, christian, covenant, divorce, marriage, marry, remarriage, remarry by joe. Bookmark the permalink.